Words or a Logo or Both in a Trademark Application? If your trademark includes words, letters, or numbers, before filing a federal trademark application you need to determine whether you will include any logo or stylistic element(s) as a part of your claimed trademark in the application. This is true because the U.S. Patent & Trademark Office asks you to specify whether or not you are claiming with your mark any font, style, size, color, or graphics. Marks without a claim of any of those style elements are known as standard character marks. Marks with any of those claims are known as special form (styled and/or design) marks. If your mark is a combination of words or characters with a logo or design elements, it can be, but it is not always the best approach to claim the logo and design elements in your trademark application. Below are issues to consider when deciding whether to pursue a trademark registration on a standard character mark or a special form mark. First a review of the types of trademarks is helpful to the discussion that follows about how to claim your trademark in a trademark application. A standard character mark is one where the mark has word(s), letter(s), and/or number(s) with no design element and no claim to any particular font, style, size, or color. The character(s) of the mark must appear in the Trademark Office’s standard character set. The characters or word(s) of the mark are provided in standard text without any style, font, or graphics. For example, U.S. Trademark Reg. No. 1,452,359, is for the mark “STARBUCKS” as a standard character mark. Special form marks cover marks presented in a variety of ways and make a claim to the stylistic elements included with the mark. Below are a few examples. This type of mark does not have a logo outside of the styling/font of the text of the mark. IBM’s U.S. Trademark Registration No. 1205090 is an example where the mark “IBM” is represented in the now widely recognized horizontally striped style. This type of mark has no standard characters in it. Nike’s U.S. Trademark Reg. No. 1,232,243 is an example of the Nike “swoosh” logo mark that has been registered alone without any standard characters. This type of mark has standard characters adjacent to the logo. Nike’s U.S. Trademark Reg. No. 1,325,938 is an example where the word “NIKE” is combined in the registration and adjacent to the swoosh logo. However, the combined adjacent elements must present a unitary commercial impression, which this mark does. This type of mark has standard characters embedded in the logo. Starbucks U.S. Trademark Reg. No. 1,815,937 is an example of a registration where the text “STARBUCKS COFFEE” is embedded in the Starbucks logo. This type of mark claims color as an element of the mark. Exxon Mobil’s U.S. Trademark Reg. No. 3,787,476 is an example of a registration where color is claimed as a feature of the “MOBIL” mark. In that registration, the letters M B I L are claimed in blue and O is claimed in red. Companies with a lot of resources to dedicate to trademark and brand protection often file several trademark applications on their marks for the same goods/services. For example, Nike owns (1) U.S. Trademark Reg. No. 0,978,952 on the standard characters “NIKE” for athletic shoes, (2) U.S. Trademark Reg. No. 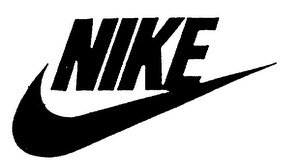 1,232,243 on the “swoosh” logo alone for athletic shoes (shown above), and (3) U.S. Trademark Reg. No. 1,325,938 on combination of the word NIKE with the “swoosh” logo for athletic shoes (shown above). Similarly, Starbucks owns (1) U.S. Trademark Reg. No. 1,452,359 on the standard characters “Starbucks” for coffee, (2) U.S. Trademark Reg. No. 1,815,937 on the Starbucks logo having the words “Starbucks Coffee” for coffee (shown above). Many times the broadest protection is achieved by filing multiple trademark applications covering the same goods/services. For example, broad protection may be achieved by (a) filing one application covering the standard characters, (b) filing an application on the logo combined with the words, and (c) sometimes filing on the logo alone without the word if the logo is used in that manner (e.g. Nike’s swoosh logo). Why So Many Trademark Registrations? Standard character marks protect just the standard characters of the mark and not any logo, graphical, or stylistic elements. Therefore Nike’s standard character trademark registration does not cover its swoosh logo. On the other hand, special form marks can be interpreted to be limited, to some extent, by their logo, graphical or stylistic elements. Therefore, while the words/characters of a special form mark will generally be given greater weight when comparing to other marks for infringement or conflict, it is possible that in some circumstances were a third party doesn’t use the exact same wording as your mark and does not have the same logo/style elements, then the third party may have a better chance of avoiding your claims of infringement based on a special form mark alone. So covering your mark in multiple registrations can give you broader protection against infringers. Another, possibly more likely, problem with proceeding only with a special form trademark is that if you decide later to change your logo or the stylistic elements in the special form mark, then you might have to file a new trademark application on the changed version depending on the extent of the changes. Further, you might not be able to renew the trademark registration of the old version because it is no longer in use. Trademark law rewards longevity of use and registration. Therefore a mark that has been registered for a long time will have a better chance of being considered strong and will be harder for others to challenge its validity. So, if you have to drop registrations because of logo changes you will not receive the benefits of maintaining a trademark registration for long periods of time. Standard character marks don’t have this problem because they cover the words within the mark as presented with any logo or stylistic arrangement. If you have a mark with a logo or design elements and you only have the funds to file one trademark application, below is some general information to consider. If you don’t have a logo or graphical representation of the mark, then it is easy, and a standard character mark should be selected in the application process. When choosing to economize by filing one application, there’s always a risk that a situation could arise with a third party where it would have been better to have filed multiple applications or a different type of application than they one that was filed. But that risk is a part of the balance being struck when choosing to reduce costs by pursuing one application. If the words or characters of your mark are very distinctive (e.g. fanciful, arbitrary or even suggestive), then it’s generally best to pursue a standard character trademark first. This is true because protection of a standard character mark covers the characters and words of the mark presented in any font style, arrangement, or graphical representation with an additional logo or without. Therefore standard character marks have the broadest protection because they are not limited to any particular color, style or graphic. However, a standard character mark will not protect the design or logo elements used by others that do not include the same or similar words/characters. If the words or characters of your mark are weak or descriptive then it is generally best to pursue a trademark application that claims the combination of the words and a logo, but only if the words and logo will be used together in your business. This is effective when the logo includes the words of the mark (e.g. Starbucks Logo). However it also can be effective if the logo and words are adjacent one another (e.g. “Nike”combined with the Swoosh). Either way, the distinctiveness of the logo should protect the trademark from being considered merely descriptive by the Trademark Office. If the characters or words of your trademark are distinctive but your logo is very important to you, you might decide to pursue a special form mark including the logo and the words given the importance of your logo (e.g. “Nike” combined with the Swoosh mark and Starbuck’s logo mark). However, if the logo is changed in the future you may have trademark renewal problems as explained above. If the stylistic features of your mark only include a particular font style or color arrangement (e.g. IBM and Mobile), then as long as you’re mark is sufficiently distinctive you will probably get the most bang for your buck by pursuing a standard character mark. As your business develops, you may decide to dedicate more resources to trademark registration. If you do, you can add trademark registrations at that time to broaden the scope of protection. The broadest protection may be obtained by filing separate federal trademark applications on the words lone, the logo, and the logo combined with the words. However, when starting out, you might decide to economize by filing only one trademark application. Whether that application should be a standard character mark or a special form mark is circumstance dependent. Many times an application on the standard character mark make sense as long as the mark is sufficiently distinctive. If it is not distinctive then an application on a special form mark having the logo and the words may be the best option. Above are some points to consider in the decision process.